How to Generate Aircel UPC Code Online from EKYC.AIRCEL.COM? How to Generate Aircel UPC Code Online from EKYC.AIRCEL.COM?? – So do you want to Port Out from Aircel (MNP)? But facing issues in generating Aircel UPC Code? UPC Generation Pages of Aircel not responding or not working? Well, here we have a straightforward working way to generate Aircel UPC Code Online using Aircel UPC Generation Page (https://ekyc.aircel.com:444/ekyc/genupc.html). Yes, you read it correctly. We have got two to three working UPC Generation Page for Aircel using which you can easily generate UPC Code for Aircel and Port Out without any Hassle. Just check the guide below to generate Aircel UPC Code Online from Official Website easily without facing any issues. 3 How to Find Aircel Sim Serial Number? 5 Getting Incorrect UPC Code? We already shared a guide on How to Port Out from Aircel through a Call or SMS? 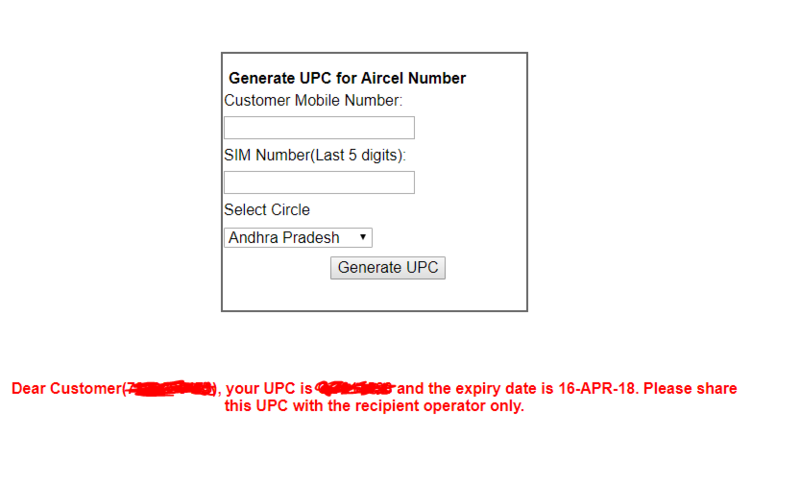 Here is the method to generate UPC Code online from Aircel Official Website. Note: “UPC Generation Page – Aircel” is facing too much load and resource usage issues. So in case if you are getting errors while generating UPC code then keep retrying. Update: One new Aircel UPC Generate Page Link added below which is working properly. So in order to generate Aircel UPC Code online (MNP Online) through Aircel UPC Generation Page (Official), we need two main things, Aircel Mobile Number and it’s Sim Number which we can get it using an App (Aircel Sim Reader). Just follow the steps below to find and get your Aircel Sim Serial Number and then generate Aircel UPC from Aircel eKYC Online Website. How to Find Aircel Sim Serial Number? Step 2: Install and Open the App and give the Permissions asked by the App. Note: This app uses Phone State Read Permission in order to read your Sim Serial Number. So must allow the Permission so that it can check sim serial number for you. Step 3: Now the App will show you your Aircel Sim Serial Number of 20 Digits. You can copy the full serial number or just the last 5 digits. Just click on Copy Last 5 Digits of Serial Number because we need last 5 digits only. 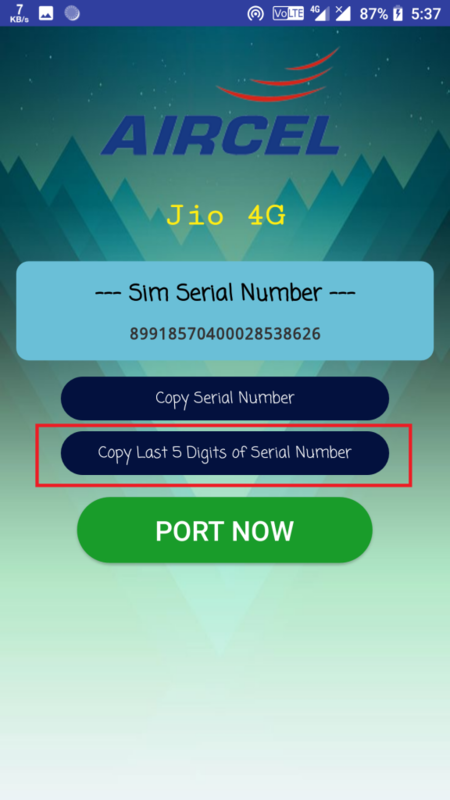 Step 4: Last 5 Digits of your Aircel Sim Serial Number will be copied. 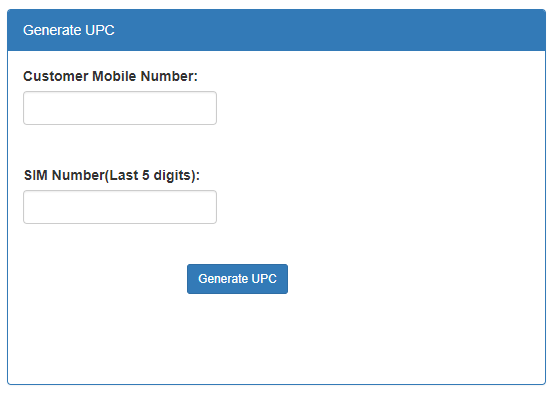 Now it’s time to use it to generate Aircel UPC Code from EKYC AIRCEL COM UPC Generation Page. Step 5: You can click on PORT NOW Button available in the App to directly visit the Aircel UPC Generation Page or you can follow the steps below to manually visit and generate UPC. Step 2: You will get a form with 2 to 3 fields. First Field: Enter your Aircel Mobile Number in the first field. Third Field (Second Link): Select your Circle/State in which you have that Aircel Sim. Step 3: Now just click on Generate UPC button and on the same page, you will get your Aircel UPC Code. Note: Make sure that the information you submit is correct. Sometimes, Aircel UPC Generation Page gives errors like Sim Info Mismatch, Couldn’t Fetch Customer Details, etc. In such cases, you just have to keep retrying. Most of the readers are claiming that they are getting incorrect UPC Code. Well, not to worry because the UPC Code is correct, just the first 2 digits may be mismatched. The first 2 digits of the UPC Code has to match the respective circle/state codes. Just click here to Check the First 2 Digits of your Circle/State and try to match it with the UPC Code you got. If it doesn’t match then just replace your UPC first 2 digits with the digits given in the list as per your Circle/State. The resulted UPC will be working UPC Code and you can try it again to Port Out. Special NOTE: Aircel UPC Generation Pages given above may take some time to load or may give errors because the page is facing a lot of load and resources usage issues. Just keep retrying or try at late night. That’s all about Aircel Online UPC Code Generator Guide. If you are facing any issues then just comment below. We will see and try to help you. Also, check out our Free Recharge Tricks and Shopping Deals. require the new UPC code for Aircel Number 7272736677 ; Circle : MAdhya Pradesh..
Can any one guide for same. I have lost my phone and I am unable to get the serial number. I want to port my Aircel number to different connection. I request you to help me with this because am unable to access my emails bank accounts. Try to contact your nearest Aircel Branch office. See if they can help you out in any way. I am unable to generate UPC code.Showing contact gallery. Is it still possible to port my aircel number? I tried all the ways to get UPC ..and it’s still not working ..please help me out as I cannot use an bank accounts or credit cards and my original watsapp number . Please help me get through this problem sir I am not able to send or receive any SMS through my phone number as well. please send the porting code for my aircel number. 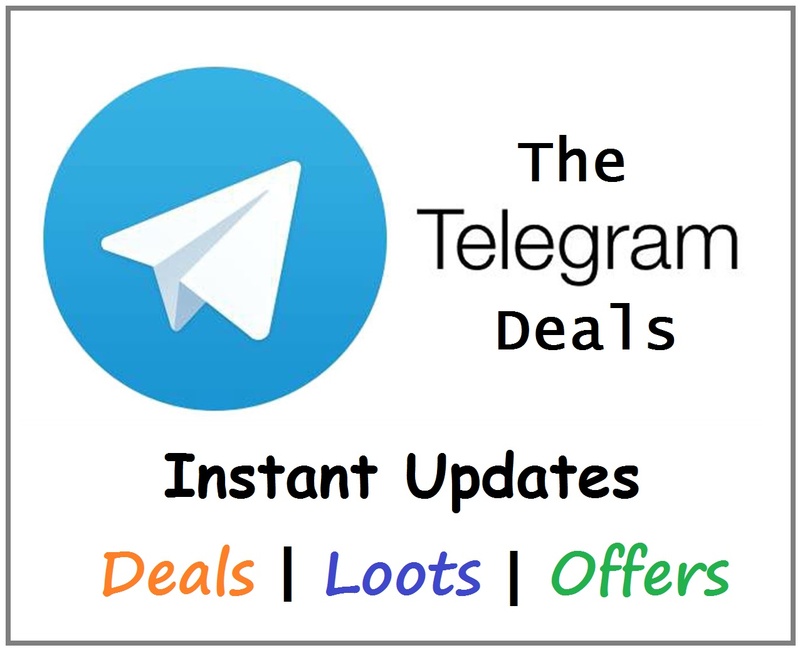 aircel mobile no is 7040244958.
kyc documents named – sagar sayaji mhase. *edited* Thank you very much for the help earlier. One more UPC please. i will be obliged dear. Aircel no. Is 8803848013 and sim’s last four digits are 18693 !!! Glad to know the guide was helpful to you. Do share it with your friends and family. any body need UPC code contact me via only whats app my whats app number is 8012680401. How to port from Reliance GSM, Network shut down now. My number was wasted. Pls help. I have my aircel sim from Jharkhand, and there is no option for Jharkhand in circle field. what should I do? I have got 2 UPC codes. 1 is starting with “DD” and another is starting with “8D” all other digits are same. What should I do now ? Most of the times, the first 2 digits of any Aircel UPC Code are alphabets. So the UPC with DD seems correct. bro how did you get the other links? are they officially announced by aircel ? No, we have no clue about the other links. They may/mayn’t be official. But we tried matching few UPC Codes generated from Official website and these new links and they matched. So it’s upto you to try or not. The second link http://35.154.143.159/upc/getUPC.jsp is working for my Aircel Assam No !!! Thanks………..
UPC codes should be 6 digit numbers, but it generate only with 3 alphabet in prefix along with preceding 5 numbers. And it is not accepted in Vodafone, Jio outlets. I replaced my State Code of Tamil Nadu as DT, eventhough reps after checking the generated UPC in http://35.154.143.159/upc/getUPC.jsp is Invalid. The first link is not loading and second link is saying- Could not find UPC code. Please check Mobile number, sim last 5 digits and circle. I are sure all the information is true. Could it be the circle Orissa instead of Odisha as there is no Orissa in it. I checked the Sim last 5 digits using the application as well as the cut out part I had. I have been using this number from 2006. Yaa, you can try Odisha for Orissa Circle. i am also facing the same problem it shows UPC code not found for number.i tried ivr stil did’t get the code.i am from kolkata and i take the aircel sim porting my reliance(gsm) no. to aircel on december 17.
http://35.154.143.159/upc/getUPC.jsp. Fill necessary values . you will get.